Doors are weak links in any soundproofing project. Buying acoustically rated sound doors can cost in the thousands of dollars. In this article we will show you how to produce a high quality sound rated door for a fraction of the price. [If you do not want to do much construction to your door then you should consider using our Door Panel Sound Barrier]. The Door itself easily allows sound to penetrate. The gaps along the sides of the door are a sound path. Mainly; the gap at the bottom of the door is the biggest sound leak. 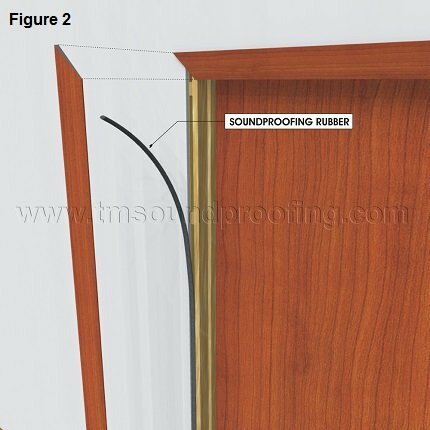 Sound waves can easily penetrate a door panel, particularly if it is of the hollow variety. Use a solid wood door with a flat surface. Buy a piece of wood the same size as your door, we like to use 1/2" thick, smooth MDF wood as this routes and paints nicely (if looks are not an issue you can even use a piece of drywall). This step will add mass to your door and will allow you to apply a layer of green glue in between. 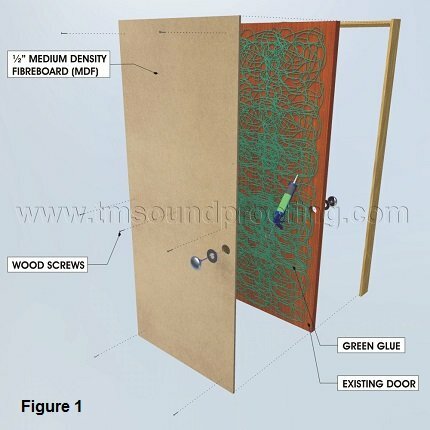 Install 1-2 tubes of Green Glue Damping Compound on the back of the MDF or on the door and screw the MDF to the door tightly sandwiching the Green Glue in between (see figure 1). You can install your handles by drilling the same size hole through the MDF, however for ultimate sound control we recommend using a dummy handle with a ball and catch type of latch in order to eliminate any penetrations through the door. [Green Glue Compound is a visco-elastic damping compound which dampens vibrations and prevents sound waves from infiltrating through the panel. For more information see, All About Green Glue]. Alternatively, for a more temporary boost to your door you can just add a piece of Mass Loaded Vinyl to your door (Nail, screw or staple it to the door). Once your door is fortified you can focus on filling the gaps around the perimeter of your door. Although it is covered by a molding, the gap between the door frame and wall framing is a big sound leak around your doors. A dense closed cell sponge neoprene Soundproofing Rubber can be used to fill this gap (see figure 2). 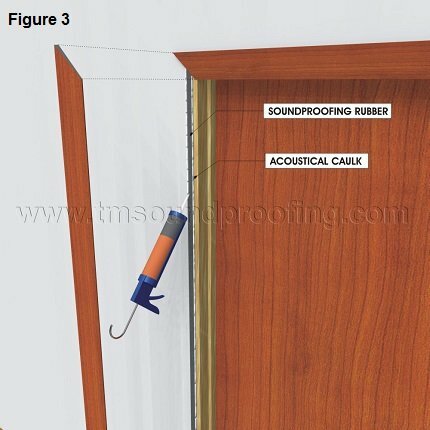 Once the soundproofing rubber is applied, use Acoustical Caulk to fill in all remaining small and corner gaps and install your molding (see figure 3). The next step involves sealing the gap between the door and the door frame along the sides and top (Jambs and Header). The cheapest way to do that is using self-adhesive weatherstripping. As you may have noticed, standard weatherstripping tends to fall apart with time. We sell only high quality silicone weatherstripping with special compression properties to give you a long lasting seal. An even better option is to use door gaskets, as these attach to the frame of the door and therefore ensure a true seal at all times. We carry a Basic Door Gasket which gives you a good seal. As doors are rarely square and flush and they tend to warp and shift we highly recommend our Adjustable Gaskets or Heavy Duty Adjustable Door Gasket which allow you to adjust the seal with the twist of a screwdriver. Although pricey, they will return superior results over many years of use. The materials used in our door gaskets are high quality neoprene with a 204 anodized aluminum retainer to ensure the seal will remain flexible and effective through constant usage, and its soundproofing properties will endure. The door gasket is applied to the two jambs (sides) and header (top) of the door (see figure 4). 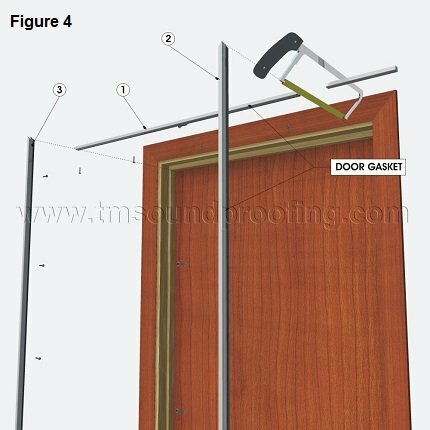 How to Measure and Install a Door Gasket. Our gaskets are available in various finishes to assure they blend well into the door and provide an unobtrusive look. The final step is sealing the gap at the bottom of the door. A standard rubber sweep will not give you a proper seal. If the seal is tight to the floor you will not be able to open and close the door, if it is not tight to the floor you will not have a proper seal. Additionally, most door and floors are not precisely square, therefore as the door swings you can find the front edge of the door coming closer and closer to the floor making installing a door sweep with a proper seal nearly impossible. The solution is to use an Automatic Door Bottom. This ingenious piece can be mounted flush with the bottom of the door and will drop a seal when the door closes and automatically raise the seal when the door opens. The best seal you will get is when using a Mortised or Semi-mortised applied Automatic Door Bottom. Being that a mortised application is not always feasible, a surface mounted Automatic Door Bottoms work great too, they just require a bit of fiddling and trimming to get the fit just right. In addition to soundproofing gaps, a door bottom has added benefits of preventing draft and light infiltration that is common through the gap under doors. Automatic Door Bottoms utilize a concealed flat spring mechanism. When the door is closed, a plunger on the side of the door bottom is compressed against the door frame which activates the mechanism. Upon activation, the mechanism will lower a neoprene seal which compresses against a doorway threshold or the floor surface below to tightly seal the gap. The seal drops from the hinge side first ensuring a constantly smooth motion and preventing drag! It retracts automatically upon opening the door. Once you have fortified your door panel and gaps at the jamb, header, and bottom of your door frame you can be assured a soundproof door with high ratings. 1) Irvin C: Do you make Automatic Door Bottoms for sliding glass doors with wooden frames? Trademark Soundproofing Reply: Hi Irvin. A mortised automatic Door bottom can be used on a sliding door if it gets tightly latched once closed. Unfortunately sliding doors are very difficult to seal properly and are not recommended for areas that require proper sound control. Thanks. 2) Aaron: It's hard to find a door with a flat surface in my size (32x76). How important is it that my door be completely flat? Hi Aaron. At least 75% should be flat. The more the better. If not try our door barrier panel which does not require a flat surface. We are getting very good feedback on that product. 3) Ciaran: Hi, Can you please explain the difference between mortised, semi-mortised and surface mounted door bottoms and why one is more effective than the other? Trademark Soundproofing Reply: Hi Ciaran, The mortised (and semi-mortised) are slightly more effective than the surface mounted. As those sit "behind" the stop molding and gaskets so there is not much leakage at the ends. Surface mounted attaches to the face of the door and does not require you to route out the door vs the the mortised that requires routing. Fully mortised keeps the ADB fully hidden from view. Trademark Soundproofing Reply: Yes. The heavy duty automatic bottoms can be used for exterior doors. Trademark Soundproofing Reply: You can Google each of those items separately and choose "image" when searching. Trademark Soundproofing Reply: Hi Ken. It is not an issue. If you would like you can use the end cap of the ADB as a metal plate on the door jamb for extra protection. 7) Am: I am trying to sound proof the entry door to a condo suite. It is a fire rated door so I can't screw or cut into it. I would like a long term solution. Any suggestions? How about a soundproof door panel that you just use an self adhesive strip of velcro. Trademark Soundproofing Reply: Hi Nick. For best performance an automatic door bottom, adjustable gaskets and an astragel are must haves. You can use an ADB (automatic door bottom) together with an specialty saddle for an even better seal however you can get away without it if your floor is straight, smooth and has a small gap. The astragel would have to start below the gasket going along the top and end above the surface mounted ADB. If aesthetics is important you can purchase a mortised ADB which will also allow you to bring both the gaskets at the perimeter and the astragal all the way to the bottom of the door (performance of a mortised ADB is slightly better as it sits behind the gasket). You can create a small wood frame around the gaskets which would conceal those as well. We also carry mortised, adjustable astragels I will send you a link to those in a private email. We do ship to Canada however shipping to the US is much simpler and qualifies for free shipping, usually. Trademark Soundproofing Reply: Yes. The heavy duty ones can go to an inch and adjust to an angle. They are about the same. However if you could install Green Glue damping compound between the door and the MDF that would be superior. 11) jerry k: Have a wood office door in a psychotherapy suite in NYC. Have already installed your doorsweep (part you step on). I need your door gasket, and maybe door bottom. 1.Can I install those 2 when I already have the doorsweep in place? 2.Can you recommend a metal door gasket and bottom. Hi Jerry, Yes you can install the automatic door bottom and the door gaskets on top of the threshold that you have already installed. I recommend you use the heavy duty automatic door bottom and the adjustable gaskets. However if you are on a budget you can go with the basic ADB and the basic door gaskets. 12) ZM: DOUBLE DOORS How do you recommend varying these instructions for a double-door (communicating doors) design, each door in its own leaf (wall) with an air gap? Do the two doors share the same through-jamb (frame)? Or do you separate the frames? If the latter, somehow the frame gap has to be filled, so I am not sure how to do this without acoustically/mechanically coupling the two frames/jambs and thus the walls. Thank you for any advice. Trademark Soundproofing Reply: That is a great question. 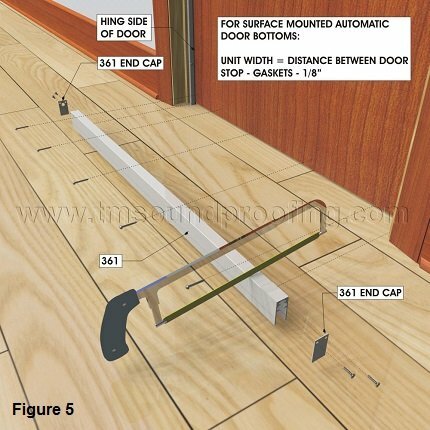 If you are putting the communicating doors onto a decopuled wall, then the way to ensure that the door frame will not couple the wall (same issue by a single door) is to make sure that the drywall is not attached to the door frame in any way. Explaining that in depth is beyond the scope of this Q&A. 13) Michelle: I am curious about the wood screws you suggest to attach MDF to an existing door (mine is hollow), for soundproofing. Wouldn't the screws serve as channels for sound to penetrate right through the MDF? My understanding is that anything penetrating from one side to the other will serve as a sound channel. That is only an issue when you are trying to decouple. However when damping as when you are using Green Glue in between the MDF and door than screwing it tightly together is not an issue and is actually recommended. 14) Aluna: I?m having a 1-3/8? thick solid core door cut to size for me, and they can do the mortises for me. I wanted to get the automatic door sweep. Would you recommend the full-mortise, semi-mortise or non-mortised style? Does it matter? I?m working with an existing door and jamb. Would it make sense/be possible to put that rubber under the molding around the door? Or is that more for new construction? Trademark Soundproofing Reply: Full mortised is slightly better as it sits behind the stop molding which allows a better seal especially when used in conjunction with gaskets.. You can remove the door moldings and get the rubber behind it. It will probably require some paint touch ups. 15) Aluna: Hi, thanks for the info. I have a few more questions, if that?s alright: -What side of the door does the rubber go under the molding, the push side or pull side? -Which side of the door does the extra sheet of MDF/plywood go on, push or pull? -Which side of the door do the gaskets go on? -Which side of the door would a surface mount automatic door sweep go on? How far would such a sweep protrude from the surface of the door? Thanks! Trademark Soundproofing Reply: Either one. Either one, although for aesthetics it usually goes on the side that sits inside the door frame. Gaskets go inside the frame on the stop molding. The door closes onto the rubber. On the push side of the door. Depending on the model from half to one inch. Trademark Soundproofing Reply: 50% and up, provided that there are no other sound leaks coming through the walls/ceilings. 17) Megan: Does this seal work on carpet, or is it only a solution for an area that has hard floor? Any recommendations for carpet? Trademark Soundproofing Reply: Hi Megan. It will work well on a berber carpet. For plush carpet you may need to put a threshold down first. 18) Rob T: IF I buy a door gasket set, can it be painted to match my trim? If so, what type of paint would be best for that application? Trademark Soundproofing Reply: The metal is aluminum so you would need a metal paint on this.